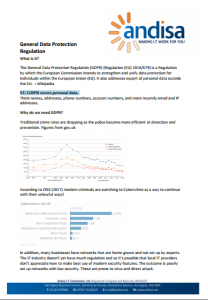 Andy recently gave a presentation to explain why GDPR is important in our modern connected world. The event took place 17 April 2018 at “Catalysts Harrogate Brigantes Rotary club”. Our white paper explains a lot of the GDPR. It highlights the need for GDPR together, some of the things you must do and some practical steps you can take to be ready for this important legislation. Why wait when GDPR readiness can be a USP to make you stand out from the competition.